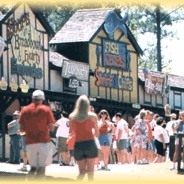 Grab a turkey leg and take a trip back in time with the knights and maidens of the Georgia Renaissance Festival. This is the Fairburn fest’s last weekend this year, so June 2 and 3 are your final chances to catch the 2012 edition. Music: Atlanta Symphony Orchestra concertmaster David Coucheron is the soloist for the orchestra’s performance of Sibelius’ Violin Concerto. The concert begins at 8 p.m. June 1-2 at Atlanta Symphony Hall. Visual arts: “From Tree to Art” is a solo exhibition by North Carolina wood turner Joe Ruminski. It opens with a reception 6-9 p.m. June 1 and continues through June 29 at 2 Rules Fine Art in Marietta. Stage: Serenbe Playhouse in Palmetto debuts a new adaptation of the beloved Lewis Carroll tale “Alice in Wonderland.” It opens June 1 and continues through July 28. Stage: The Stage Door Players present the operatic farce “Lend Me A Tenor” through June 10 at the North DeKalb Cultural Arts Center in Dunwoody. Stage: Revisit the ’60s and the music of Frankie Valli and the Four Seasons in the Broadway hit “Jersey Boys.” It’s at the Fox Theatre through June 10. Stage: “Xanadu” is a musical based on the giant hunk of celluloid cheese from 1980 that shoehorned Gene Kelly and Olivia Newton-John into an insanely over-the-top blend of roller-disco and Greek mythology. The show runs through June 16 at Actor’s Express. Stage: “Doubt, A Parable” is the latest production from OnStage Atlanta in Decatur. The show continues through June 2. Festival: 97.1 The River’s Wing & Rock Festival sets up its seventh annual edition in downtown Woodstock. It begins at noon June 2 and 1 p.m. June 3. Festival: Help celebrate the 29th year of the Virginia-Highland Summerfest, which brings in musical headliners the Fixx and Marc Broussard. The fun begins at 10 a.m. June 2 and 3 around John Howell Park. Hamfest, the Atlanta Radio Club’s 83rd annual event. It starts at 8 a.m. June 2. Festival: The fourth annual Artlantis Arts and Music Festival spotlights up-and-coming Atlanta artists and musicians. The fest begins at 10 a.m. June 2 at Druid Hills Baptist Church. Music, benefit: The 3 Light Benefit Concert will help out Delta Airlines flight attendant Karen Perry, who lost her three children and their father in a private plane crash in 2011. The concert begins at 6 p.m. June 2 at 14th Street Playhouse. Music: Atlanta Sacred Chorale presents its season finale, “Voices Ascending,” with an assist from organist Nicholas Bowden. It starts at 8 p.m. June 2 at Emory University’s Schwartz Center for Performing Arts. Stage: When the matriarch of the family passes away, the dynamics of the family change in the musical stage play “Broken.” Performances are at 2, 5 and 8 p.m. June 2 at Georgia Tech’s Student Center Theater. Stage: A woman falls in love with a man who has trouble letting go of his past in “Complicated Melody: The Stage Play.” Performance is at 7 p.m. June 2 at the Balzer Theater at Herren’s in downtown Atlanta. new piece of art. It opens with a reception 7-10 p.m. June 2 and continues through June 30 at Beep Beep Gallery. Family fun: The Marcus Jewish Community Center’s Flip Flop Day at the J is a summery celebration. Enjoy music, outdoor pools, a splash park, an inflatable bounce house and more from 11 a.m.-2 p.m. June 3 at the Dunwoody venue. Performing and visual arts, families: Community Day at The Woodruff will offer many free activities at the High Museum of Art, the Alliance Theatre and the Atlanta Symphony Hall. The event commemorates the 50th anniversary of the Orly Airport plane crash in France that killed 130 passengers, many of them Atlanta arts patrons. The crash was the catalyst for the creation of the Woodruff Arts Center in 1968. The event begins at 11 a.m. June 3 at the Woodruff Arts Center. Music: Two of country’s biggest stars, Kenny Chesney and Tim McGraw, bring their “Brothers of the Sun” tour to the Georgia Dome. Jake Owen and Grace Potter and the Nocturnals will open the show, which begins at 4:30 p.m. June 3. See our interview with the two singers. Music: 99X Unplugged in the Park presents long-serving Atlanta blues outfit Delta Moon. Some Dark Holler opens the show at 6 p.m. June 3 at Park Tavern.